Too many meta-analyses of extinctions of giant kangaroos or huge sloths use data that are poor or poorly understood, warn Gilbert J. Price and colleagues. In March, the last male northern white rhinoceros died. The sub-species joins a long list of large land animals that have gone extinct over the past 100,000 years. The reason for the demise of the northern white rhinoceros (Ceratotherium simum cottoni) is undisputed: poaching and land disturbance by people. By contrast, who or what caused the extinctions of mammoths, enormous ground sloths and other Quaternary megafauna remains one of the most contested topics in the historical sciences. Was the culprit early humans who dispersed from Africa more than 75,000 years ago? Or was it climate change? The latest way to try to settle the debate involves meta-analyses. These attempt to link the timing of extinctions to shifts in the climate, or to evidence of the first appearance of humans in a particular region. Over the past five years, the number of meta-analyses has greatly increased (see ‘In fashion’). Many have been published in high-impact journals, and they are starting to shape the debate. Understanding why some groups succumbed while others survived could provide insights into how modern-day species might — or might not — survive climatic and environmental changes, and into the resilience of natural ecosystems to increasing anthropogenic impact. But in our view, the ‘big-data’ approach cannot, at this point, get us closer to an answer. There simply aren’t enough good-quality data. An understanding of what drove the extinctions requires detailed analysis on a species-by-species basis. This means investing effort into finding more fossil specimens and verifying the ages of those that have already been discovered using improved dating methods. It also means relating the timing of species’ existence and disappearance to detailed local environmental, climatic and archaeological records. 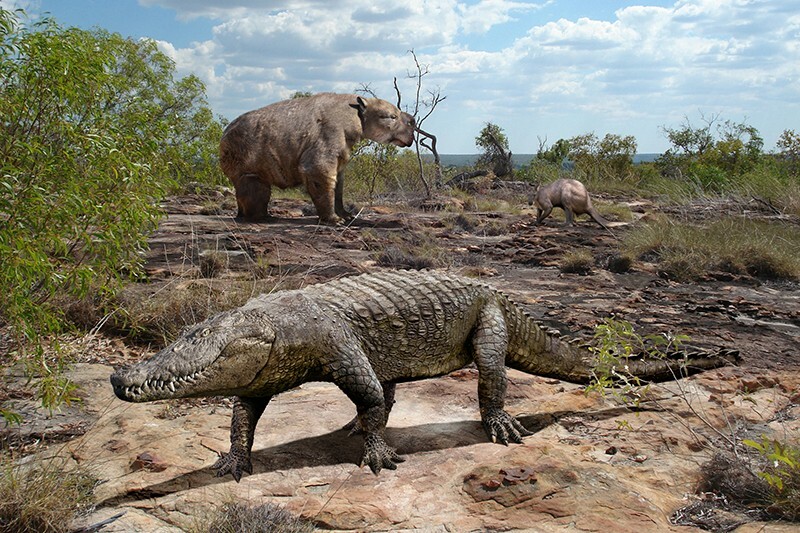 For a typical meta-analysis, researchers mine the literature for dates associated with now-extinct megafauna, as well as for estimates of when humans arrived at a particular region (on the basis of archaeological and other data). In some cases, they then combine these records with global-scale palaeoclimate data, such as those obtained from ice cores collected from the Arctic. By mapping correlations between events, investigators try to identify the dominant factor driving species losses. Over the past two decades, most of the meta-analyses that merge continental or global-scale data sets have pointed the finger at modern humans. In fact, some researchers contend that the results are so clear that there is no need for further debate1. For any meta-analysis, however, the reliability of results is largely governed by the ‘GIGO’ principle: garbage in, garbage out. In our view, most of these analyses depend on questionable data, making the results hard to interpret at best. Six key problems undermine many of the studies conducted so far. Outdated geochronological information. Models frequently use data from studies that have been superseded. 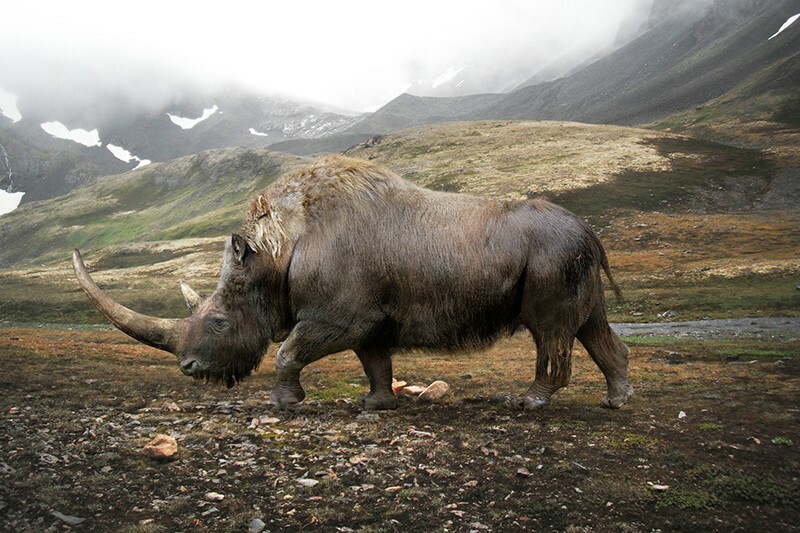 For instance, during the 1980s, radiocarbon dating of species such as the Eurasian woolly rhinoceros (Coelodonta antiquitatis) suggested that it survived well into the Holocene — perhaps until as recently as 3,600 years ago2. But refinements in dating methods have shown that the rhinos had actually disappeared by about 14,000 years ago3. 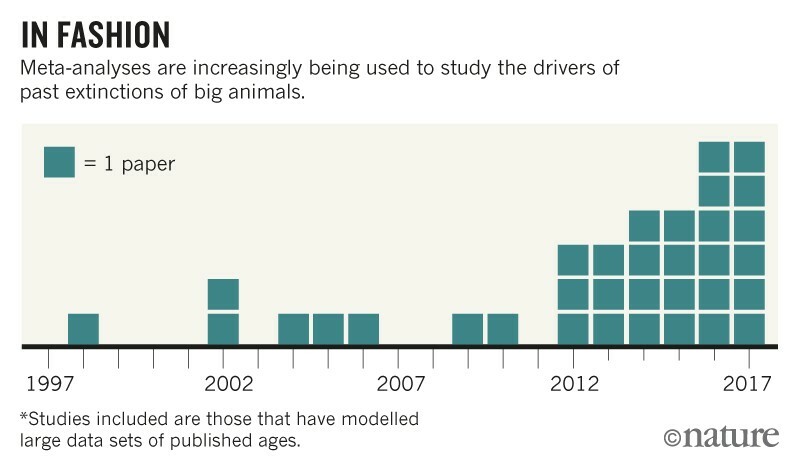 Some of the most recent big-data studies still use erroneous early dates for the rhino4 and other species5. Contested dates. In other cases, the dates associated with certain species are still in question. For instance, researchers first estimated the age of the elephant-like Stegodon trigonocephalus not by dating the fossils themselves, but by dating fossils from other animals collected from deposits more than 100 kilometres away6. Other investigators have flagged problems associated with using inferred ages7, yet these continue to be fed into meta-analyses8. Insufficient data. Some meta-analyses take the last appearance of a species in the fossil record to be the time when the animal went extinct5. In the rare cases where hundreds of samples have been found, for instance for mammoths and mastodons, a species’ disappearance from the fossil record could well signal its demise. Yet where only a few specimens exist, the last appearance in the fossil record might have little bearing on the timing of the extinction. Problematic proxies. In the absence of fossil bones, some researchers have used proxy data to test megafaunal extinction hypotheses. For instance, the coprophilous fungus Sporormiella is a common component of the pollen and spore fossil record. Because it occurs on animal dung, an abundance of it in a sediment core is often taken to indicate high numbers of big herbivores. Some investigators assume that a decrease in the appearance of the fungus over time and its eventual disappearance from the fossil record signal the extinction of megafauna11. Yet Sporormiella lives on the excrement of a vast range of both big and small animals, including mammals and birds, herbivores and even some carnivores12. Its abundance is also affected by factors such as climate and water flow. Thus, on its own, levels of Sporormiella in a pollen core can’t provide information about which species were present at any one time, or in what numbers. Insufficient scrutiny. Lastly, long lists of extinct species (frequently just names and numbers in supplementary materials) often do not receive the necessary level of scrutiny. This has led to some unfortunate errors. 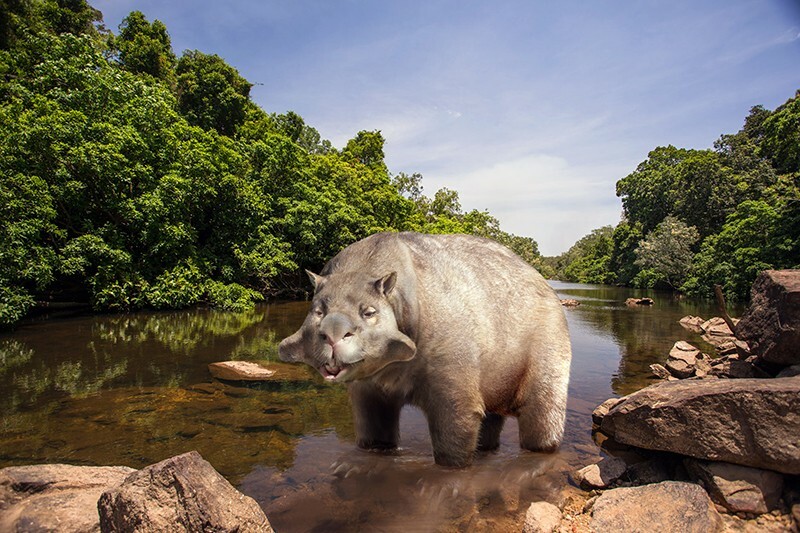 The authors of at least two studies4,13 have argued, for instance, that Homo sapiens caused the demise of giant marsupials such as Euryzygoma dunense and Euowenia grata. These were extinct for millions of years before Homo sapiens even appeared; they are known only from the Pliocene, the period 5.3 million to 2.6 million years ago. Another paper14 suggested that the genus Macropus went extinct in Australia some 40,000 years ago. In fact, Macropus is alive and kicking: it includes Australia’s extant kangaroos. Arbitrary definition. Megafauna are commonly defined as Quaternary terrestrial vertebrates with a mass of at least 44 kilograms — roughly 100 pounds. This is a nice, round cut-off, but it is essentially arbitrary. Also, in some cases, ‘megafauna’ are not so mega. For instance, they could include extinct terrestrial vertebrates that are larger than their extant cousins but that weigh considerably less than 44 kilograms. An extinct relative of the modern-day Australian echidna — Megalibgwilia ramsayi — is considered to be megafauna, even though it weighed only around 15 kilograms when it existed (until at least around 100,000 years ago). In other words, megafauna are highly biologically and ecologically diverse, with several species separated from each other by hundreds of millions of years of evolution. Researchers should not therefore expect them to have responded in the same way to changes in their environments — whether driven by humans or by climate. We think that as long as data from the fossil record remain scant, an understanding of what drove the extinctions of large animals over the past 100,000 years requires detailed analysis on a species-by-species basis. This means trying to find new fossils and verifying the estimated age of specimens previously found — for instance, through repeated sampling, or by using improved techniques to date museum specimens. It also means taking into account all the local palaeoenvironmental information that is available to develop a detailed understanding of the palaeoecology of each species and its ecosystem. To reconstruct the diet of an animal, researchers can use stable isotope analyses of tooth enamel. Pollen cores can indicate the local vegetation at the time. The geochemistry of certain formations nearby, such as stalagmites, might give clues about the local climate. Changes in the nature of the sediment laid down in a nearby creek bed, or in the deposition of sand dunes, might hint at local landscape changes. And so on. Broad global palaeo-temperature records are likely to be a crude guide to climatic and environmental changes at local scales. For each species, investigators should also strive to develop a clearer understanding of the human populations that lived alongside, and the nature of their interactions. This could be obtained by analysing DNA samples extracted from ancient human remains, for instance, or by studying middens, ancient dumps for domestic waste. For example a study published earlier this year combined new dating approaches with chemical analyses of the bones of the cave bear (Ursus spelaeus), to show that its herbivorous diet had remained unchanged up until its last appearance in Europe, some 23,500 years ago15. Moreover, cut marks on its bones have revealed that some of these animals were hunted by humans. And researchers have linked the morphology of the extinct eastern African antelope Damaliscus hypsodon to the open, dry grasslands it inhabited, to track the demise of both16. Megafaunal fossils can now be dated with much greater efficiency and precision — including those of animals that existed several hundreds of thousands of years ago. This is thanks to various advances, such as combined U-series and electron-spin resonance dating. Other emerging techniques, such as the extraction and analysis of ancient DNA, can shed light on changes to the population size of now-extinct species. Several studies have used such approaches to demonstrate that populations of taxa, from giant Irish elk (Megaloceros giganteus)17 to the Beringian steppe bison (Bison priscus)18, plummeted many thousands of years before their ultimate extinction, apparently because of deteriorating local climates and habitat changes. Some might counter that we’re averse to change and are simply finding another reason to be alarmed about the demise of the field sciences in a digital world19. But our argument is not with modelling per se. With good data, models could provide crucial insights into large-scale changes and the broad nature of the interactions between humans and other big animals as humans dispersed from Africa. More data, of better quality, can be obtained only through fieldwork and rigorous analysis of fossil materials.